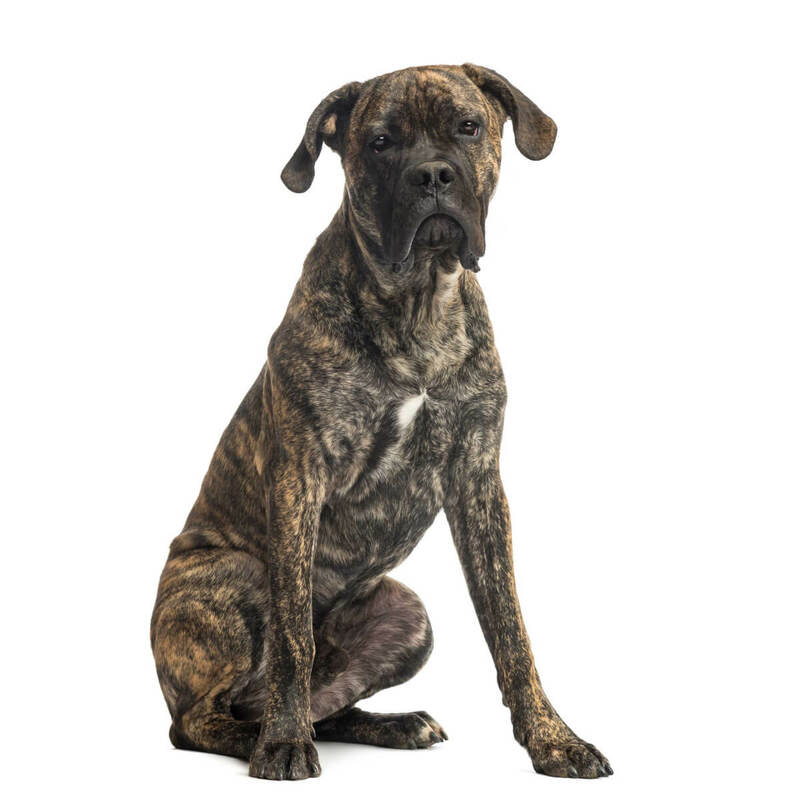 The Cane Corso (pronounced "KAH-NAY" "KOR-SO") is a Italian Molossus dog descended directly from the ancient Roman "Canis Pugnax". 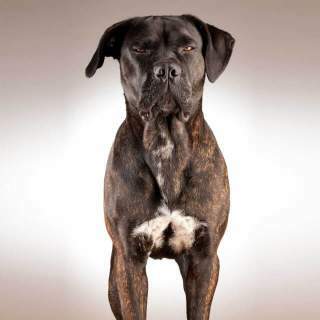 Italians prize this breed for their ability to remain confident and assertive when guarding yet being docile and affectionate around the family, especially kids. They may appear intimidating due to this cool nobility and massive, muscular body but the truth is they are not only a versatile guardian but an excellent companion. Members of this breed are acceptable for first time owners, those with children, with other pets and people seeking a guard dog. They are easily trainable and eager to please but this MUST be done at an early age; if you do not establish with this breed early that you are the leader, they are very hard to control. Ideally the owner will have a large home, fenced yard, or farm; they need ample space and quite a bit of exercise. In fact, outdoor daily exercise and at least a long walk is about as much of a "must" as consistent training as a puppy. Grooming is nearly effortless but they are light shedders so allergy sufferers may need to look elsewhere. Overall, the cane has few health concerns and should live 10-11 years. 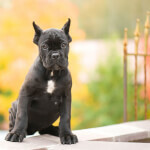 Below are details and specs for the Cane Corso dog breed. Cane Corso are large dogs that are not for small home or apartment dwellers, ideally. If you insist on keeping them in a small dwelling, they need plenty of outdoor exercise. Their huge heads and strong, muscular bodies total a whopping 88 to 110 plus pounds! Females are on the smaller side of this scale and stand 23-26 inches at the shoulder while males are at the larger end, reaching 24-28 inches. Proponents of the Cane have excellent points on why this dog is the best; they are intelligent, easily trained, protective, docile, affectionate, good with kids and other pets, easily groomed and appear noble and elegant. Things to consider also are the absolute necessity to train them from an early age to see you as the authority and to give them plenty of room and exercise. This should prevent them from running your household, being aggressive over food and toys, and becoming destructive. 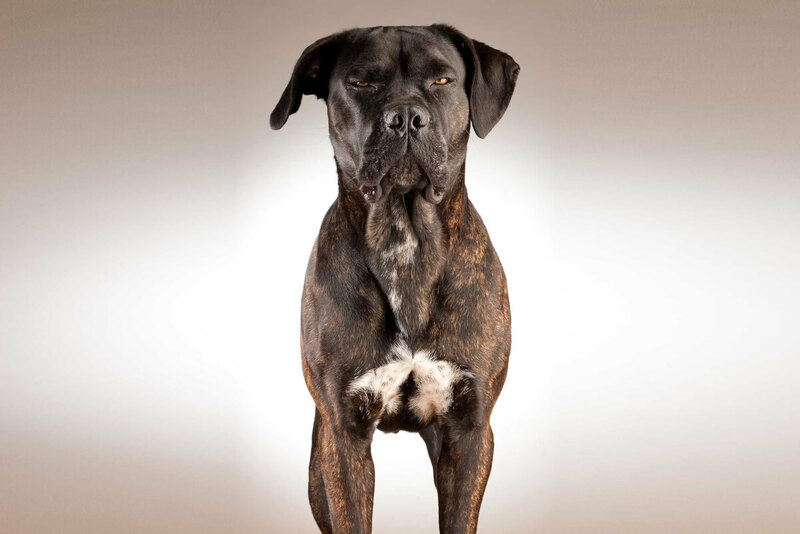 Members of this breed, intensely loyal and confident, make excellent guard dogs and appear quite intimidating; if trained properly they can easily distinguish between an acquaintance and a threat. 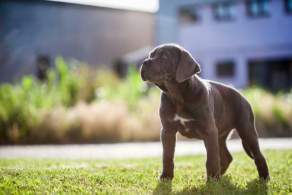 The Cane Corso can be considered a medium maintenance breed. Grooming will be easy; just brush once per week and regularly check the teeth, nails, and ears for signs of needed maintenance. It is important to note these dogs are light shedders. 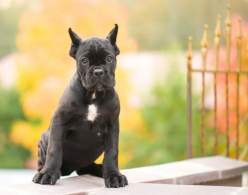 Members of this breed are easily trained and enjoy pleasing the owner, making them good choices for first time owners. Special attention must be paid to performing this consistently at a young age, making 100% sure that you are the dominant one. Lastly, this is a large dog with fairly large exercise needs; outdoor playtime is a must and a walk, daily, no exceptions. They enjoy doing sports, hikes, runs, etc. with their families. The Cane has its origin in Italy and was very much unknown anywhere else until 1988; they are particularly unchanged in Southern Italy (Puglia, Sannio, Lucania) where they are now mostly companion dogs. This would be especially important since they faced extinction in the 1970s but were able to rebound due to these well-preserved farm specimens. The name comes from the Latin "Cohors" or "protector/guardian". In Italian Cane means "dog" and Corsus means "strong and robust". They go far back, to as early as 1137 A.D., and are a clearly of the Molossus type. 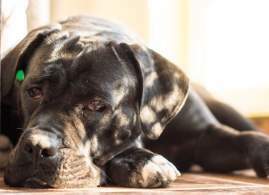 In fact, this breed is directly descended from the Canis Pugnax which was the Roman Molossian; they are also closely related to their later occuring cousin the "Neapolitan Mastiff", which also is directly descended from the Canis Pugnax. The Cane is lighter and more versatile than the latter. Members of this breed hunted large game such as wild boar and participated in battles and wars. They also guarded livestock, property, and, of course, people. 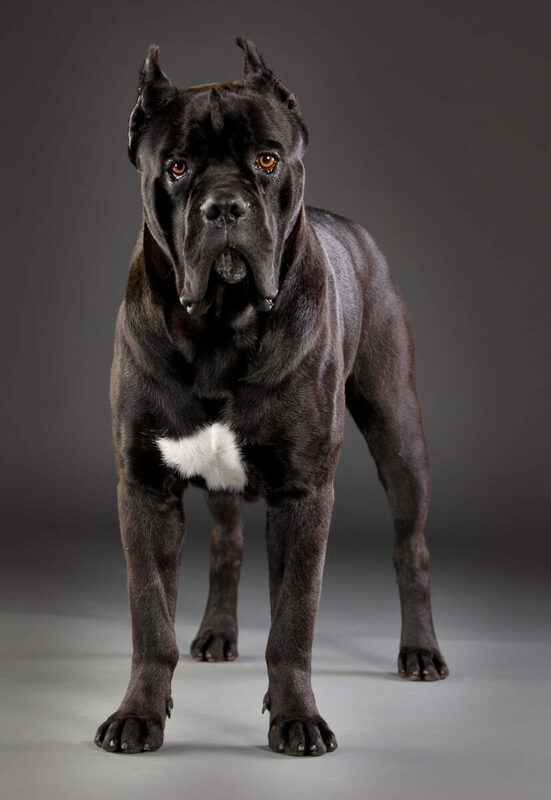 According to the breeds U.S. club the Cane Corso Association of America, the breed is so prized in Italy that many phrases exist that exemplify their traits and compare them to human counterparts; one such example being: Can corso can be used to describe a man that is proud in his attitude and respect. Around the start of WWI the economy and farming areas of Italy were both in decline, causing Cane Corsi to lose their jobs; even the farms that made through rough times began replacing them with machines. WWI and WWII also ravaged the population of this breed due to all the disaster and destruction along with most owners being called to arms. By the 1970's they were nearly extinct until a group of Italian men revived the breed with existing specimens from southern Italy. 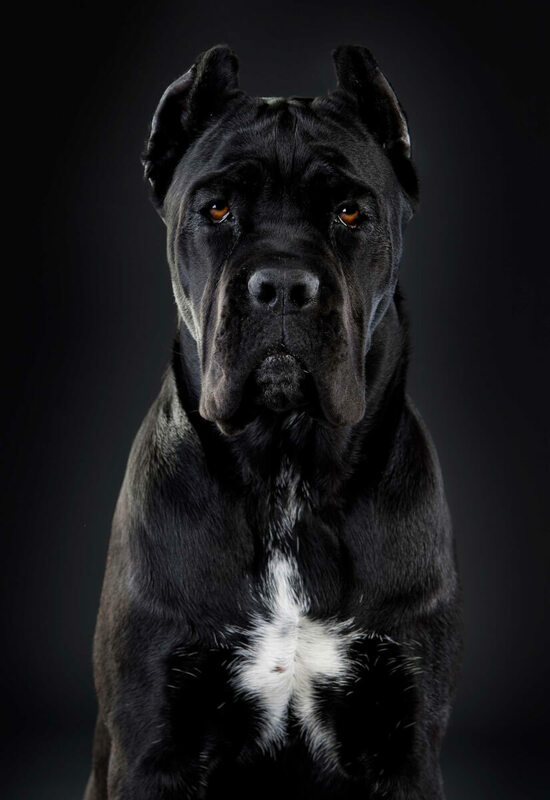 By 1983 the first breed club, the Society Amatori Cane Corso was established in Italy. Canes were not imported into America until after 1988 (by Michael Sottile SR), however, the AKC acknowledges them as the 36th most popular breed! The ENCI added this breed in 1994 while the FCI followed suit in 1996. The Stock Foundation Service also added this breed in 1996, yet they were not fully recognized by the AKC until 2010. 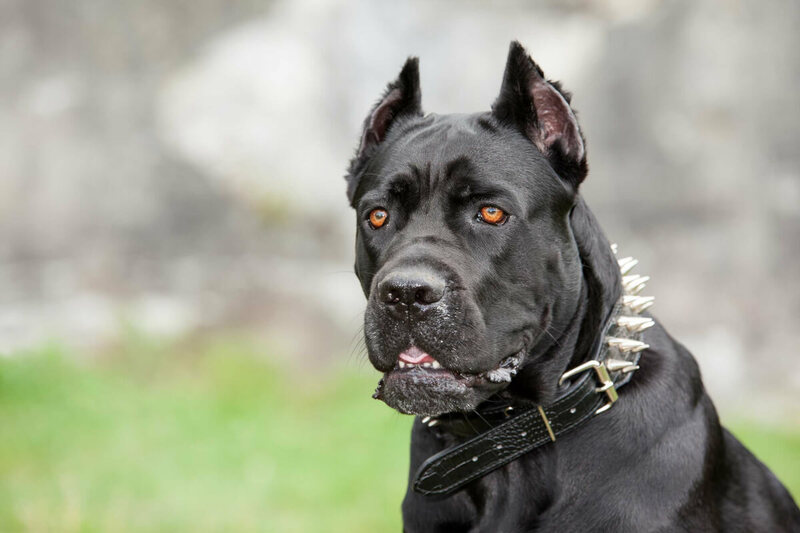 The Cane Corso appears strong, muscular and slightly intimidating at first glance. Upon closer inspection they possess a smart and noble, and they move with easy grace that some refer to as "majestic". In true Molossus style, they have a head so large and wide it measures almost one-third the height at the shoulders. While the skull has a downward slope, the nose arches slightly upward. The neck has a bit of dewlap and transitions nicely in a broad, deep chest (reaching half the height) and muscular shoulders that sit just above the back line. They possess muscular, straight and well-proportioned forelegs leading into round feet with toes arched in a catlike manner. Canes have hind legs that begin in broad and muscular thighs, are also straight and end in oval feet with arched toes. The short, shiny coat lies close to the skin and appears slightly thicker when the undercoat grows out in cold weather; note that the coat is not smooth, but coarse and waterproof. The short, shiny coat of the Cane Corso is considered "standard" by the AKC in 7 different colors. Black, fawn, grey, red and black, gray and chestnut brindle. Yours may or may not have a black or gray mask on the face, which is also considered standard. Cane Corsi can be intimidating in size with the huge heads and large, muscular bodies; it is not uncommon for them to top 100 pounds and reach 28 inches at the shoulders. They need a large home if kept indoors and a large yard or farm if kept outdoors. Generally, females range from 88-100 pounds and reach 23.5 to 26 inches at the shoulders while males are somewhat larger, toppling scales at 99-110 pounds and reaching 25 to 27.5 inches at the withers. Canes are amazing family dogs due to their affectionate and protective nature, especially with children. They are eager to please the family and will happily join in outdoor activities and adventures. If trained and socialized as a puppy, they will fare well in a multi pet household and should not see smaller pets as prey. Although they have hunting roots, they specialized in large game. They should also naturally be docile and protective around livestock, as they have been farm guardians during the majority of their history. Members of this breed share an affectionate bond with their owners; this coupled with their traits of intelligence and confidence make them easy to train. They can be molded into excellent guard dogs since they are eager to please their owners yet naturally docile enough to be able to assess the difference between a friend and unwanted stranger. Nearly all owners agree that training is so attainable that Cane Corsi will do fine with a first time owner. However, not confident and smart breeds need to be trained early or they will not see you as the leader; time must be spent teaching this gentle giant the family hierarchy. They do not fare very well if left alone for extended periods of time. They form close and affectionate bonds with their owner and prefer to be near them. They also ideally should not be crated or confined to small spaces for long portions of the day; they are large dogs that desire exercise. Some things owners can do to ensure their Cane Corso has the proper temperament (so they don't dominate you) are as follows: Training them where to sleep, not overbonding with them, socialization with pets and kids, potty training and bathing, and finally and MOST IMPORTANTLY who is the boss (human). If these things are not done consistently and early, you may find yourself with a 110-pound problem. Canes are not aggressive, especially towards known people, however, if you find them being snappy over his possessions or when you move him, as well as pulling the leash or not listening when you want him off the couch-- he has not properly trained to see you as the dominant being. Naturally being a gentle, docile and affectionate breed, they will thrive on your praise and treats. Canes are loving and affectionate towards children and will bond with them readily. They will be very loyal and take the protection of their family and children very seriously. Members of this breed are docile and large enough not to be bothered by accidental rough play. Small children should be watched around this breed simply due to their sheer size; they may accidentally knock them over. Most owners agree the docile and trainable nature of the Cane Corso lends itself well to a multi pet household. They will likely be friendly and playful with other pets and, since, they were large game hunters, should not show much prey drive towards smaller household critters. It is notable, also, that they have a history as protectors of the farm and livestock, so they will harmoniously co-exist with livestock animals and can be an asset to your farm. The typical exception to these instances are when your Cane has not been properly trained from a young age, especially to respect you as the leader, in which case they may be snappy and possessive over toys and food. Confident and assertive, Cane Corsi make great protective family dogs. Most times one look at such a large, well-muscled dog that portrays an imposing nobility will be enough to keep the malicious at bay. Early training and socialization will help ensure they can tell the difference between a friend and an unwelcomed visitor. 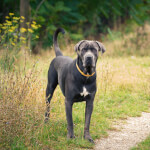 Below are pictures and images of the Cane Corso. 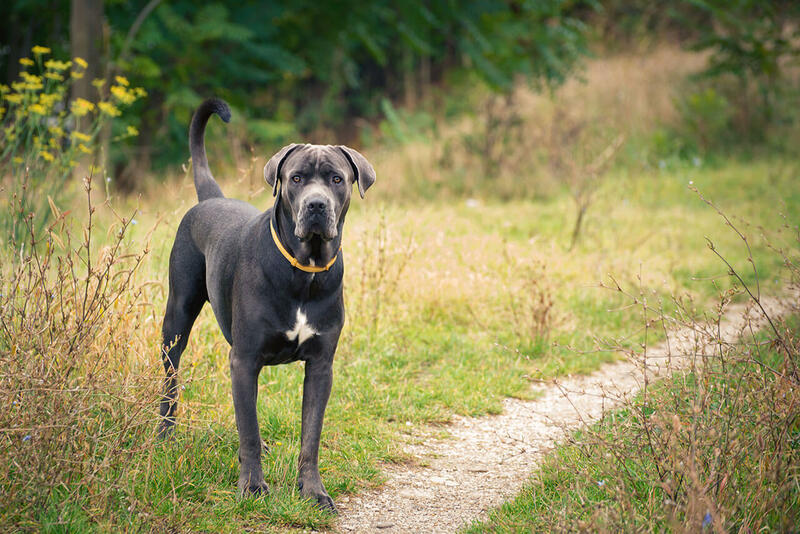 Overall, Cane Corso is a medium maintenance dog. Grooming will require the least effort and consists of little more than a weekly brushing and keeping an eye on their ears, teeth and nails. They do shed lightly, however, and those with pet allergies or a dislike for vacuuming should keep their Cane outdoors. Training will be easy for these intelligent, eager to please guys; the flipside to this is that it MUST be done early and consistently or they will run your household in an unpleasant way. Simply put, the most important aspect that opens the door for training is establishing yourself as the alpha, otherwise, everything that follows will be smooth sailing. Finally, exercise is a necessity for these large dogs. They are muscular, athletic and require daily outdoor exercise if they don't already live outdoors; even still, they benefit greatly from other athletic activities outside the yard such as walks, runs, hikes, biking, etc. This breed requires very little effort when it comes to grooming. Their short, shiny coat can be kept in top shape by brushing weekly with a soft brush; the natural oils from their skin will help them stay gleaming. They are light shedders, but be prepared for a bit of cleanup. Keeping any pet on a regular schedule of examining teeth and ears for cleaning as well as nails for trimming is always very important. 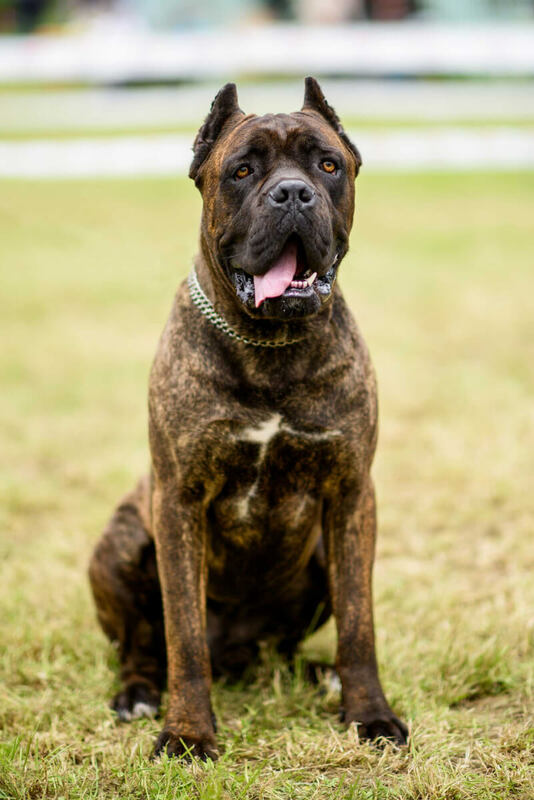 Members of this breed are large, muscular and naturally athletic so they will need a moderate amount of daily exercise. Playtime outdoors in a fenced yard (or large farm) will make them very happy. They bond very strongly with their owners and are great company for long walks, runs, hikes, bike rides, etc. No matter what your personal activity level, your Cane will need plenty of exercise. Ideally, your Cane will have a large fenced yard to run and play. They are traditionally farm dogs and if they are familiar with/raised on a large expanse of land they likely do not need a fence in that case. Members of this breed can live in a large home or outdoors; they do not express good temperament if left in a confined space all day. They are large and of moderate energy so they need plenty of exercise. No temperature restrictions are documented. The Cane Corso has origins in Italy, which has a seasonal climate, so it will likely fare well in both hot and cold weather. They have an undercoat that grows denser as the temperature cools off. Hip dysplasia is a possibility later in life and can lead to arthritis and degenerative joint disease. Bloat is also not uncommon in large dogs and should be monitored by feeding them appropriately (2 times per day) and watchfully, making sure that bolting and gulping are discouraged. Cane Corsi are also susceptible to Demodex Mange that can be triggered by a variety of reasons, even stress. Evidence suggests their genes makes them more likely to have defects in their immune system which allow these triggers to easily become uncontrolled and allow the mites that normally live in the hair follicles to thrive to dangerous numbers. Strangely, eyelid abnormalities are also common to this breed such as: entropion (inward curling), ectropion (outward curling) and cherry eye (glandular malfunction). Regular checkups at your veterinarian will help to monitor and even prevent many health issues allowing your Cane to achieve the 10-11 year lifespan.